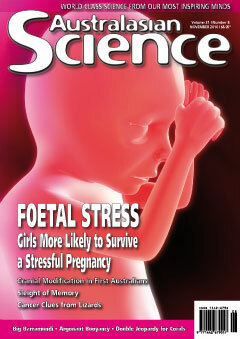 Female babies are more likely to survive a stressful pregnancy. A gene found in a pregnant lizard may provide important information about the origins and treatment of cancer in humans. Evidence of head shape modification among Pleistocene Australians helps refute claims of an evolutionary connection with Indonesian Homo erectus. Our memories can easily deceive us, for good or for ill.
By expertly manipulating air gathered from the sea surface, argonauts are able to control their buoyancy and traverse the world’s oceans at depth. More barramundi survive to adulthood during big flood years due to increased feeding opportunities. Scientists have a social responsibility to maintain high ethical standards in their work. Colin Carter is putting the production of French black truffles onto a scientific footing. Lowe Tech: A Win for Science? The minority government may do more for science than either of the major parties would have done with a secure majority. Naked Skeptic: Who Has the Backbone to Stop This? Chiropractors should not promote their services as an alternative to vaccination or treat children for conditions like autism and asthma. The earthquake that caused billions of dollars of damage to Christchurch, including to the University of Canterbury, occurred on a previously unknown fault line. A study of the public’s understanding of science has revealed how little many Australians know about the basics. A Tasmanian parasitic wasp (Cotesia urabae) has been approved as a biological control for a less appreciated import to New Zealand: the gum-leaf skeletoniser (Uraba lugens). Most venoms don’t work at very cold temperatures, which makes the poison produced by the Antarctic octopus particularly interesting. The suspected risk of early melanoma posed by sunbeds has been confirmed.